Cold air can be dry. Combine that with a heater running day and night—now the air is even drier. It’s an endless cycle of miserably dry air! For some homeowners, the next step is to go out and buy a portable humidifier. They might buy several of them, or just one for the bedroom of the family member that is most sensitive to dry air. 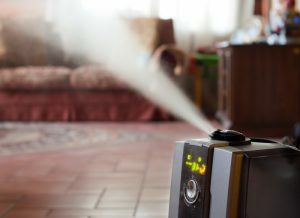 If this situation sounds familiar, then you’re most likely fed up with the limitations of these portable humidifiers. That’s why a whole-house humidifier in Deptford Township, NJ would be one of your best investments. The first thing you’ll note about a whole-house humidifier is how it eliminates all the inconveniences associated with their portable cousins. Whole-house literally means the whole house can now benefit from humidification. No need to buy several units. No messy cords or extension cables to deal with. They connect directly to your water line—you can forget about filling up the water tank every few hours. Integrated with the thermostat, allowing it to turn on and off when necessary. Installed in the ductwork, so it will remain out of sight and out of mind. One of the big drawbacks of a whole-house humidifier versus a portable humidifier is that it won’t be shaped to look like an adorable penguin. If you can live with that setback, then you’re going to like the whole-house humidifier much better. One of the big benefits of shifting from portable to whole-house is the fact that, well, you can treat the whole-house. Plus, without the need for a water tank or separate controls, you’ll be able to run it even through the night or morning without having to refuel it, nor will you have to worry about the air becoming too humid. Humidity levels are best between 30% and 50%, with 45% being the ideal level. A little-known fact about humidifiers is that they can help you feel warmer than you actually are. After all, humidity in the summer makes the summer air several times worse, right? You’ve likely heard the phrase, “It’s not the heat, it’s the humidity” more times than you can count. The same principle applies to cold air. Introducing some humidity can help you dial back the heater a few degrees without feeling any less comfortable. And finally, a great reason for humidifying your home is that it will help your sinuses work properly. Without the right amount of moisture, you’re far more susceptible to catching respiratory illnesses like the common cold. Keeping humidity at the perfect balance is just as good for your health as it is for your comfort.